If you find yourself admitted to the hospital for just about any reason, the FIRST “treatment” you’ll get (after you’ve gone through the initial vital signs check) is an I.V. I don’t think we give enough thought to the need for an I.V. and I believe that a lot of questions about hydration can be found through the I.V. protocol that is followed by hospitals. Although your doctor may sing a different tune when you’re out-patient (drink plenty of “fluids”), they all follow the rule-book for what the body really needs when you’re in-patient…they prescribe water. The purpose of an I.V. is to supply extra water to a dehydrated patient and/or to assure that the daily water and salt needs or “maintenance needs” are met for patients unable to take them by mouth. Naturally, there are circumstances through which the patient would not be physically able to drink water but; for the sake of staff convenience AND to enhance the billable goods, the I.V. protocol is followed for almost everybody. 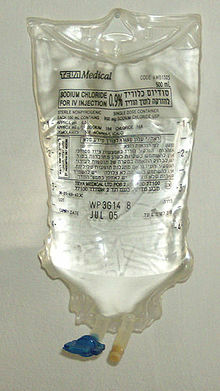 I’m quite sure that the fact that most Americans are chronically dehydrated makes an automatic I.V. make a whole lot of sense. Although the amount of I.V. fluids infused depends largely on the weight and the needs of the patient, according to Web MD it is typically between 1.5 and 3 liters (50-100 ounces) a day for the average adult. Rest assured, the medical professionals KNOW that we need 50-100 ounces of water just to hydrate in a sedentary state. Funny how physicians fail to emphasize the need for lots of water OUTSIDE of the walls of the hospital. When was the last time you drank 50-100 ounces of water? If you need 50-100 ounces of water just to sustain hydration in a SEDENTARY state, imagine how much more water the body needs when it’s actually moving around living life! So you see? The I.V. protocol holds the key to answers about proper hydration with the “right” kind of water. IT MATTERS how much water we consume to maintain a healthy state and IT MATTERS what kind of water we drink to properly hydrate the human cells….in and OUT of the hospital. If the QUANTITY and the QUALITY of your I.V. water matters that much…don’t you think the QUANTITY and the QUALITY of the water you consume by mouth does too? Autism, Change your water, Environmental HEALTH risks, Green cleaning, Green living, Kangen Water, Kids with Cancer, Kill germs, Water, Water Ionizerdehydration, does it matter what kind of water we drink?, drink plenty of fluids, how much water do we need to drink?, I.V. fluids, ionized alkaline water, kangen water, restructured water, what kind of water in an I.V. ← Toilets, Taps & Trash! Thanks for sharing very helpful information. Looking forward to more great information.